Last night the film Tommy was premiered in 35 cinemas across Denmark. 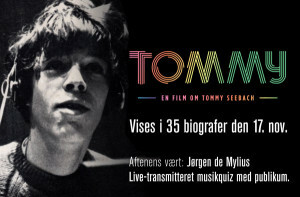 A nationwide quiz about Tommy Seebach’s music, hosted by Jørgen De Mylius, followed. EuroVisionary was present in order to bring you a review of the film that will later be shown on TV and released on DVD. Hope for English subtitles as you don’t want to miss this fantastic film! with him and clips from his private life and various performances including all of his Danish final participations was shown. Bundgaard from Kirsten & Søren (Denmark 1984, 1985 and 1988) also told how their companionship ended when Tommy had failed to send out some important tapes to the radio stations and instead had been drinking all night in their studio. paying his bills and big was his relief when he finally in 1993 got back in – due to a disqualification. When he then went on to winning it looked like all the problems would go away again. Concerts for over a Million Kroner were booked in less than a week – Tommy was back on the top! Unfortunately he went further down when he came 22nd in the international final in Dublin. He was being blamed for Denmark not being able to participate in the coming year and Tommy’s frustrations became even bigger. He had just written a song and performed it the best he could. It wasn’t his responsibility that it won the Danish final as clearly as it did. Tommy’s frustrations over the accusations towards him after the poor result in Dublin immediately meant a heavily increased consummation of alcohol. This led to his wife Karen leaving him, taking the children, who meant everything to Tommy, with her and Tommy moving to an apartment right across a bar that quickly became his second home. shopping and might stop up for a sausage and hear one song before continuing in your daily programme. The film ends with the touching story about how we went to a circus performance with his children. He had stopped drinking at this point and the children had for a little bit had the feeling of having their dad back. He walked with the children in his hands towards the circus like other dad’s were doing. The only difference being that Tommy’s children was adults at this time… six days later he died. Seebach’s life – for better and for worse. It is a well made production and I can only recommend seeing it. I hope that the planned DVD release will include English subtitles as this is not just a film for Danes to see. After the film a quiz took part where you by answering a question about Tommy could participate. Two audiences was called up on their mobile phones – it ended up being one in Rødovre, near Copenhagen and one in the cinema hear in Aalborg where I was present. They each had to answer various questions about Tommy Seebach’s music – and the winner became the one from Aalborg. North Jutland had beaten Copenhagen – which just added a little more flavour to it all.